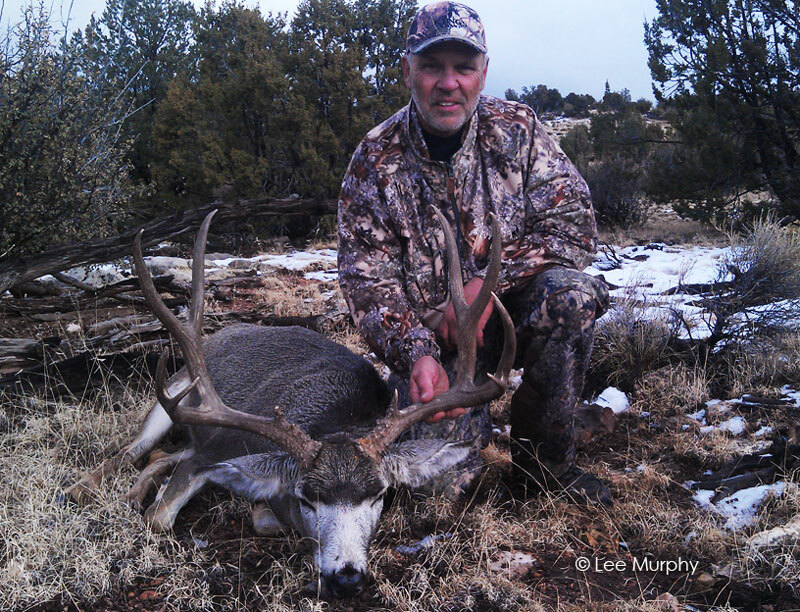 Arizona Over-the-Counter Archery Mule Deer taken with guide Lee Murphy. 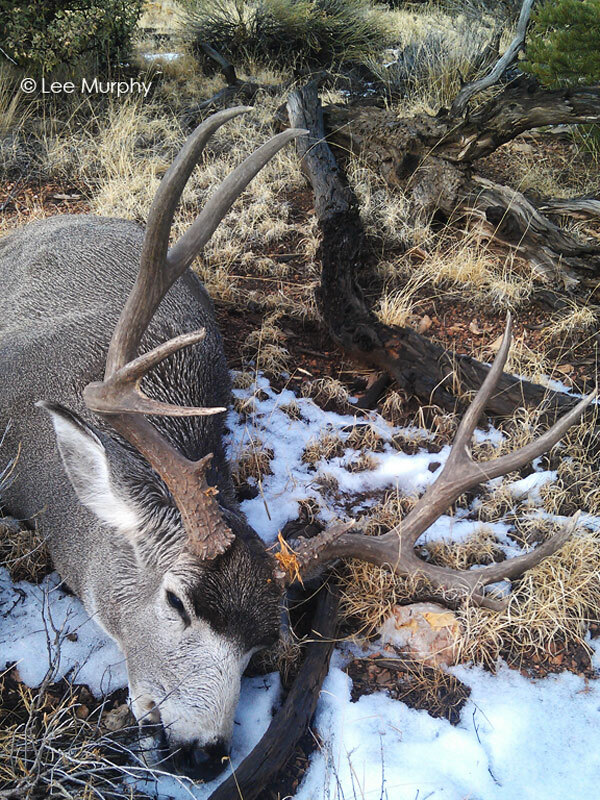 It was day three of Brad’s six day Arizona archery mule deer hunt. We had glassed and Brad had stalked the same mule deer buck twice, during the first two days of his guided mule deer hunt. We estimated the mule deer buck to be over 180 inches, but after some close calls, the mule deer had moved into some less desirable glassing and stalking terrain, so we decided to try a new piece of country. Within just a few minutes, I had located two different groups of does that each had rutting mule deer bucks. Patiently, we watched the groups of deer as some smaller bucks pushed the does around. We kept glassing as a large mule deer buck got up and moved into view to check the does. With all the mule deer rutting activity, we decided to see if we could get closer. We carefully laid out an approach route and 45 minutes later we were creeping up to our marker bush. The timing could not have been better, we didn’t even have time to get excited or an arrow nocked as the big mule deer was pushing the smaller 24” 3 x 3 right toward us and away from the does. The bucks were preoccupied with the does on their mind and didn’t notice as Brad nocked an arrow. Then, as we sat frozen behind the little bush the bucks passed by 30 yards from us. I gave out a “BLAT” and Brad let his arrow fly. It was now nearly noon the next cold and crisp day. We had been searching for any sign of the big mule deer buck all morning. The light skiff of snow which covered any tracks or deer sign was now melted. Brad’s arrow had hit just a little farther back than he wanted it to. I knew Brad was getting discouraged and we were both starting to have doubts about recovering his mule deer buck. We decided to split up and Brad was up high on the ridge glassing and looking for any sign of the buck, while I continued searching for the bucks tracks. The tight and rocky ground made it hard to track, even before the snow hit. I had trailed the buck for 2 1/2 miles the evening before and it was now extremely slow. I patiently scrubbed the ground back-and-forth back-and-forth trying to see any hint of the buck’s last tracks. Then…. there it was, a set of hardly visible tracks that had been snowed on. The tracking pace now had picked up. 20 minutes later I was pretty sure it had to be the buck’s tracks but still had my doubts. Finally, I found the bed that he had laid in and there was a small amount of dry blood. With my eyes glued to the ground looking for any part of his tracks, I nearly tripped over the big old mule deer buck. He was DOWN! 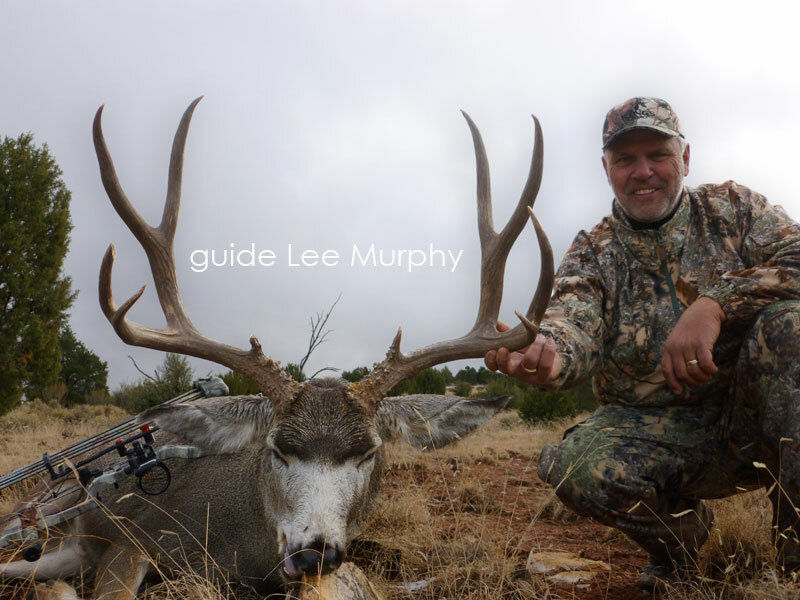 The big Archery Mule Deer buck laying as guide Lee Murphy found him. 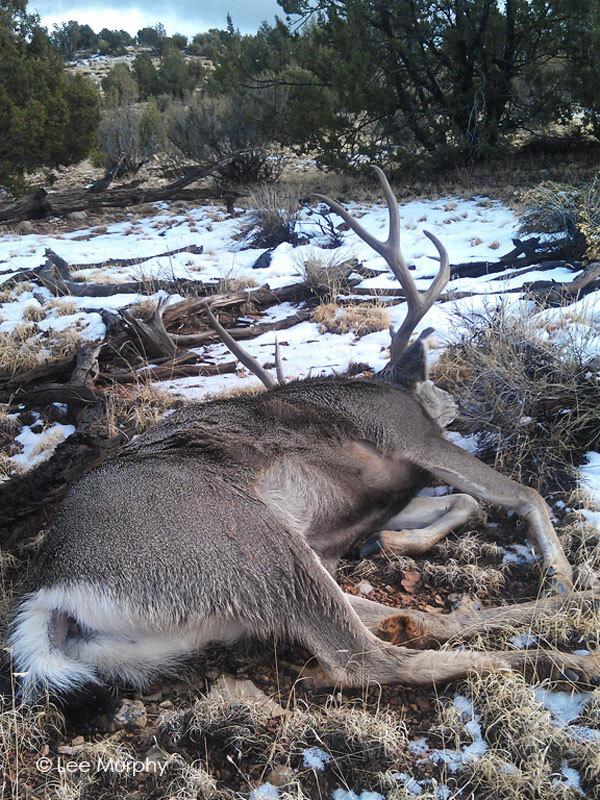 Persistance and effort helped find this big Archery Mule Deer buck on the ground. Brad with his well deserved archery mule deer trophy. We hope you enjoyed this short Archery Mule Deer Hunt story, please feel free to check-out our Archery Mule Deer Guided Hunt Page.